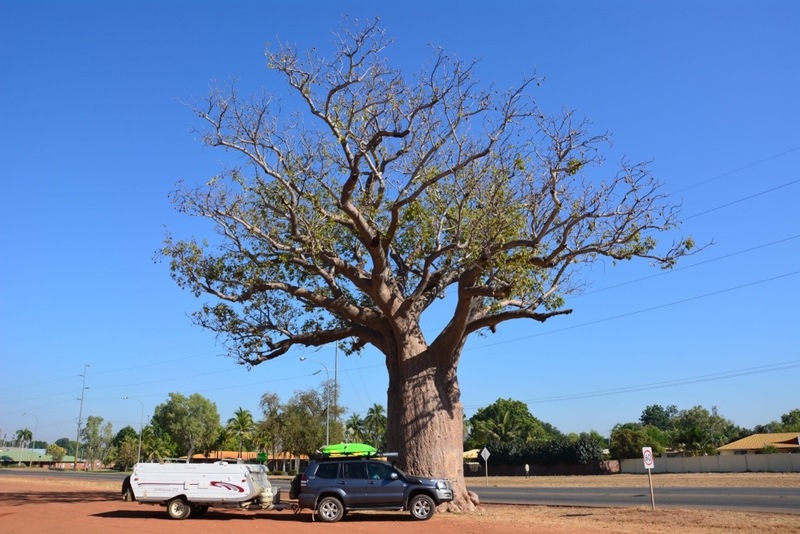 Loved seeing all the Boab trees as we came into WA – there may just be a few photos of them to come! 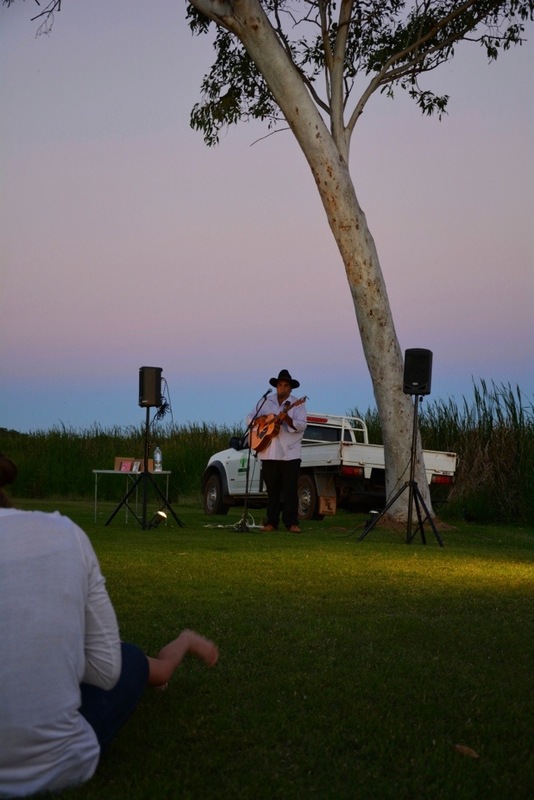 Once we had decided that we were going to head back north to Mareeba in a month’s time to be Mango farmers – we decided that we would push over to Western Australia as quickly as possible to at least get a couple of weeks on the beach there before our trip was over. 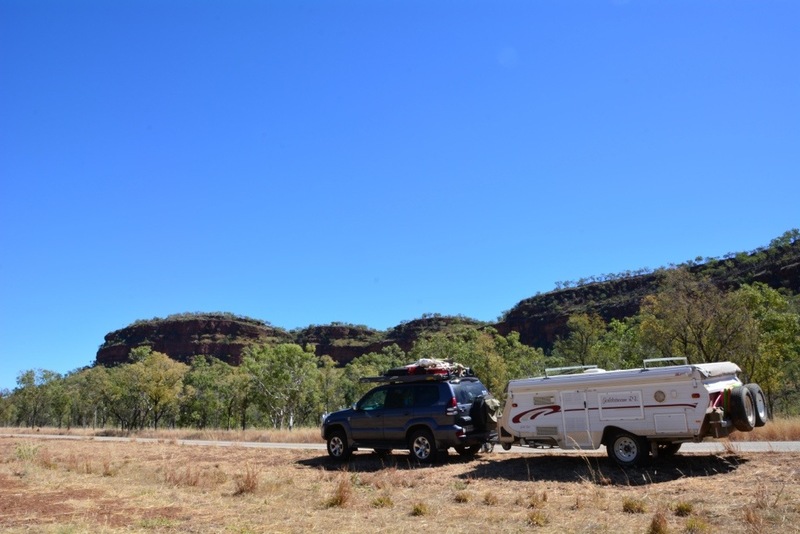 So we headed out of Katherine and aimed for Kununurra where we had managed to phone ahead and book the car in for a service and new tyres which it needed in order to do the many kilometres we had ahead of us! 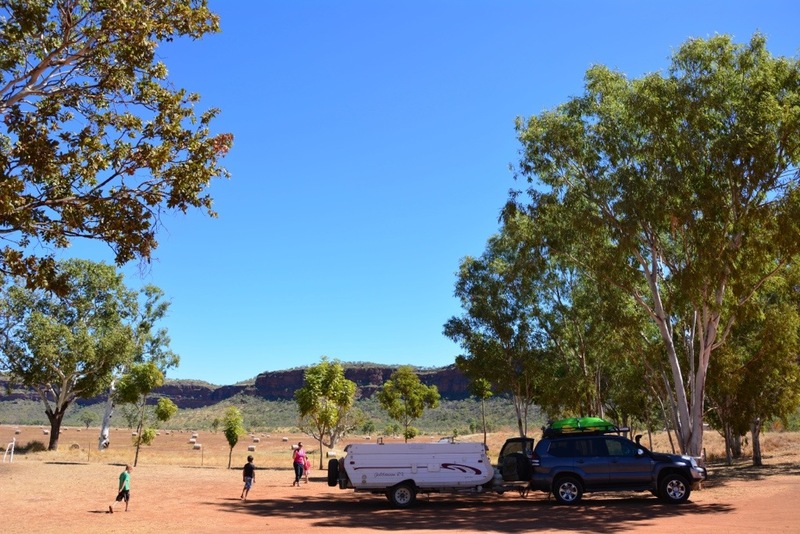 The service and tyres were much cheaper in Kununurra then in Katherine and we could not get the car serviced in Katherine until the end of August – that was how far ahead they were booked out!! So on our last night at Katherine Gorge – I cooked up as much of our veges as I could in a pre-cooked dinner for the next night, made a banana bread with our bananas and shoved as much apples, carrots and celery into the kids as I could manage in preparation for our crossing over the border into WA where you are not allowed to bring any fruit or veges in with you. 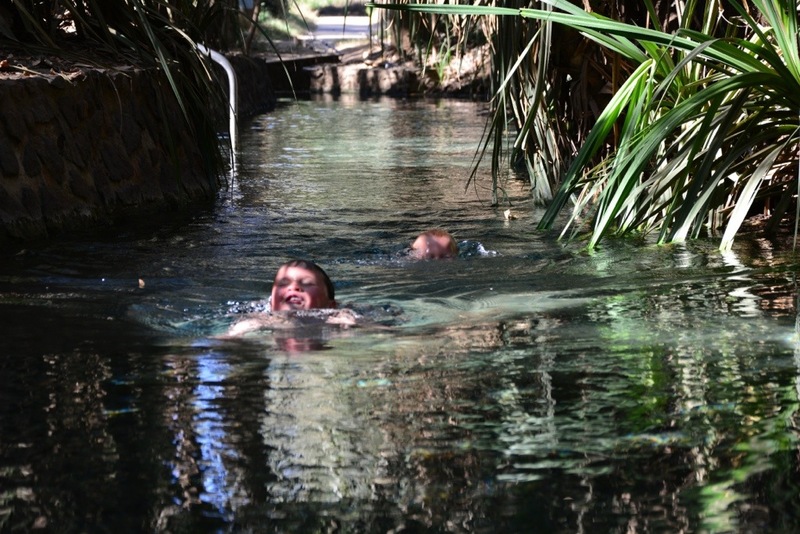 On the way out of Katherine we had a quick dip in the hot springs which were just lovely – we thought they were as good as Mataranka! 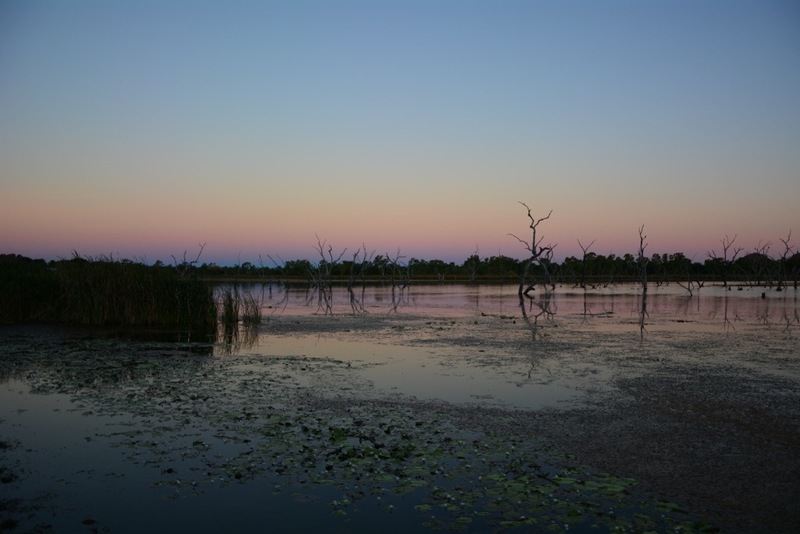 The drive from Katherine to Kununurra is just over 500km’s and is quite a scenic drive. 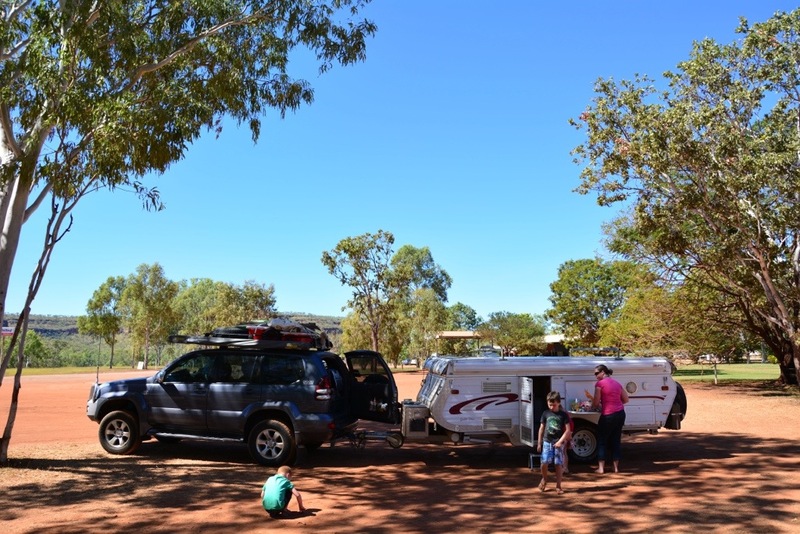 We stopped for lunch at the Victoria River Roadhouse and we showed the kids how to eat tomatoes like apples here (with plenty of salt) to finish off the bag of tomatoes I was still carting – I had offloaded a bag of carrots at the campground that morning but forgot about the tomatoes. 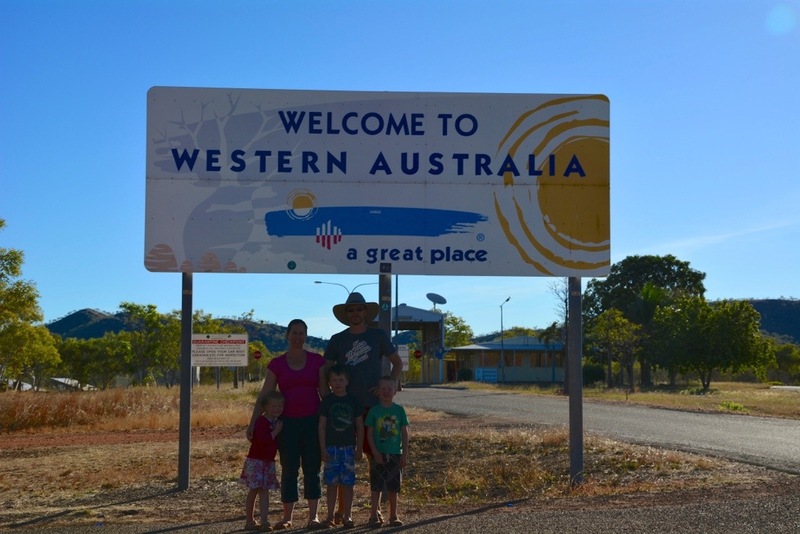 We were very excited to cross the border and the quarantine point in to Western Australia – madly eating the last of our apples as we approached the checkpoint! 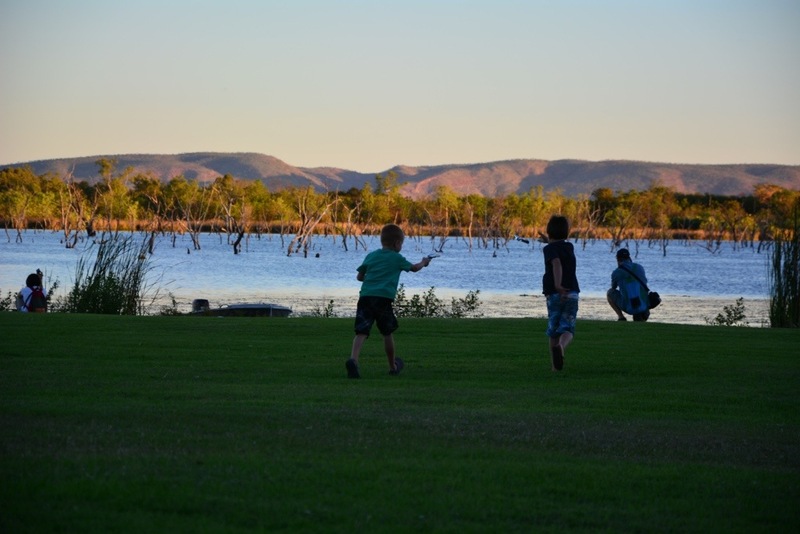 We arrived in to Kununurra just before dark and found a site at the Kimberleyland Caravan Park on the recommendation of the ‘Families Travelling Australia’ Facebook group. It was a lovely caravan park but very busy! 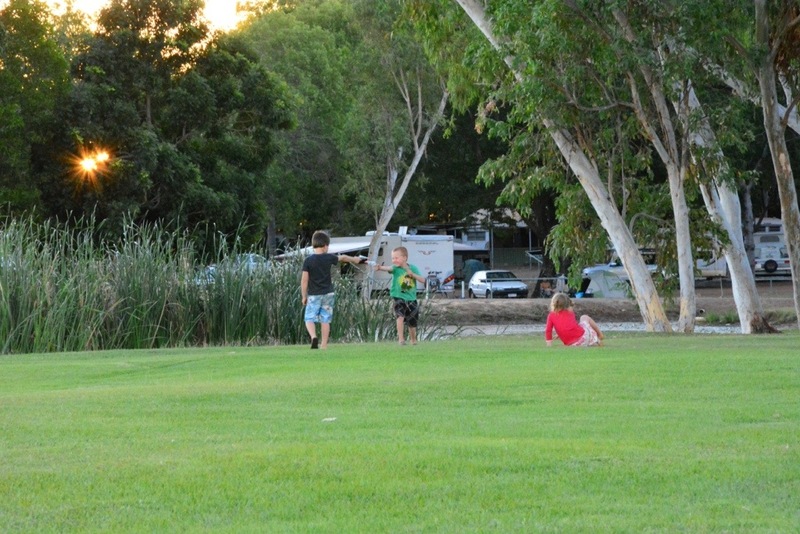 The caravan park is on the banks of the lake and has lots of shady sites (still dusty though!). We arrived just in time to hear a pretty good musician performing in the park on the banks of the lake so we quickly set up camp and went down to watch. We were all pretty excited to see green grass! 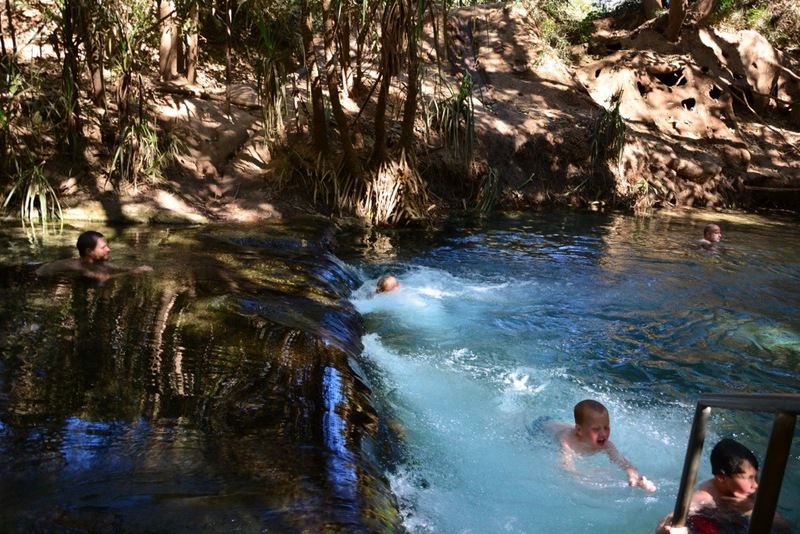 Kids happy to be able to roll around and play without being covered in dust! The 1.5hour change in timezone (back) messed with our body clocks a little as we were super tired by 8pm but we were all then up at 5am the next morning! The early morning was ok though as we had to be checked out of the campground – dropped the camper off across the road at the park, and have the car dropped off at the mechanic all by 7am so for once we were happy to all be awake early. 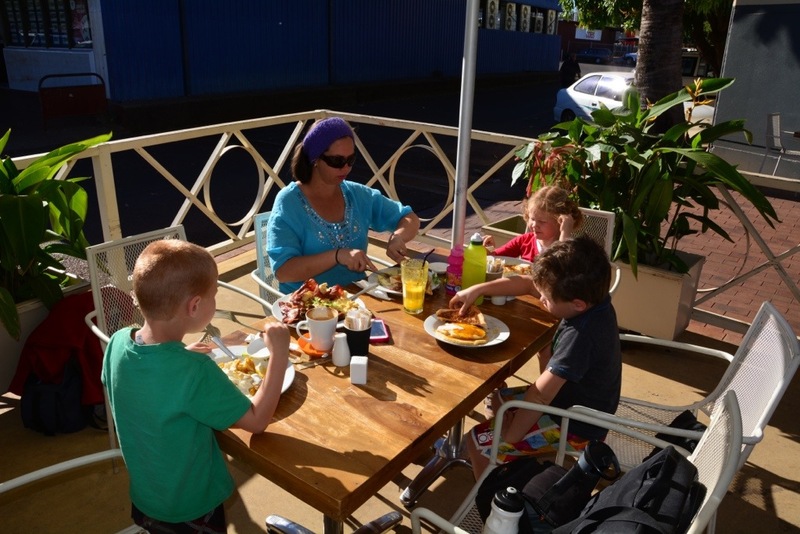 We then spent most of the day having a nice breakfast at a lovely cafe called the ‘Wild Mango Cafe’ where we decided to do some ‘research’ in preparation for our mango farming journey ahead and try the pancakes with mango syrup as well as the mango smoothies – delicious!! We then wandered around town and checked out all the shops before spending a couple of hours relaxing at the library where Toby and Lexi got to sit in with a local kindy class’s library session and Jack read another ‘Diary of the Wimpy Kid’ book. 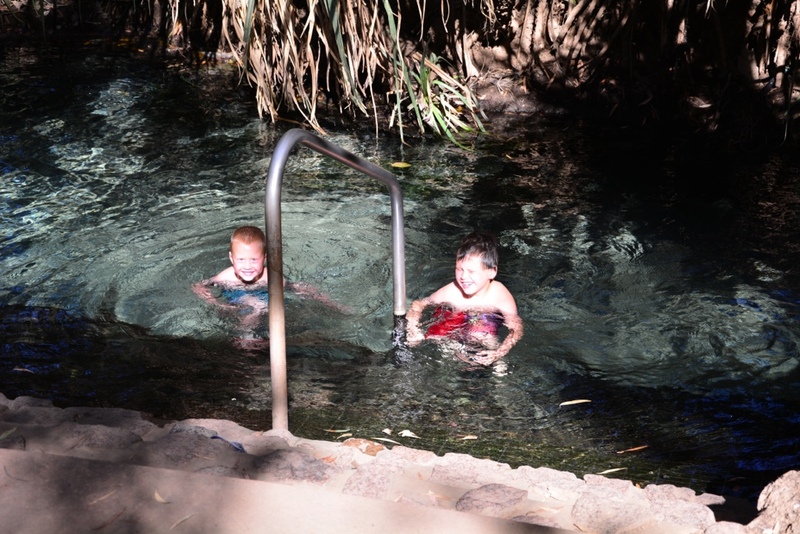 Matt and I had a chance to research what we wanted to do with our time in WA and book our sites at Middle Lagoon and Cable Beach Caravan Park. 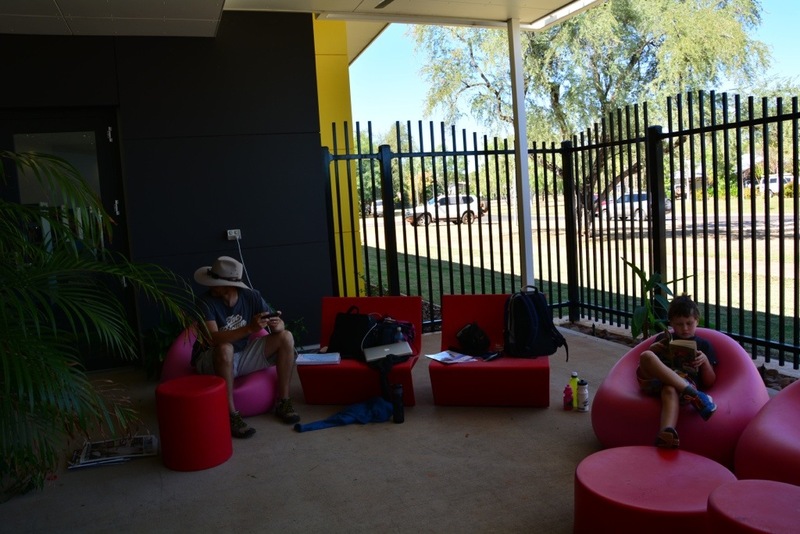 The Kununurra library was awesome – the best we have come across so far! We made ourselves at home at the library! 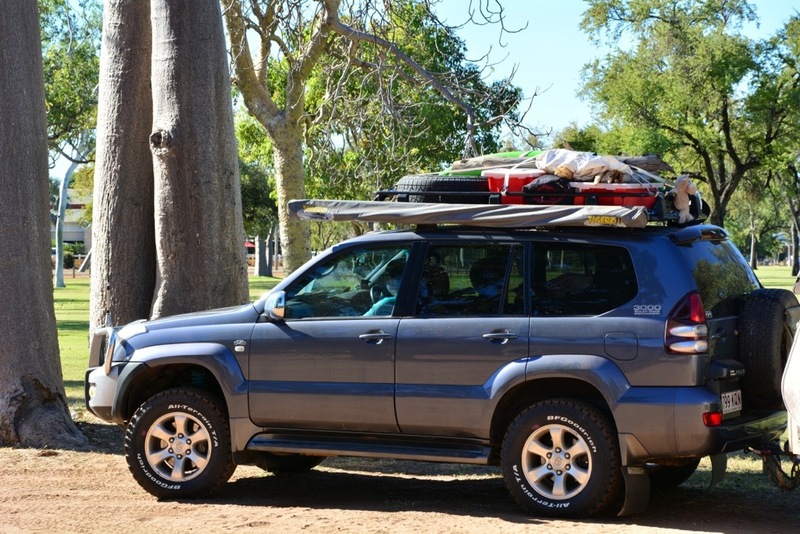 We finally picked Peter Prado up all spiffy looking with his new shoes and a morning at the ‘day spa’ and headed out to Lake Argyle at about 2pm. 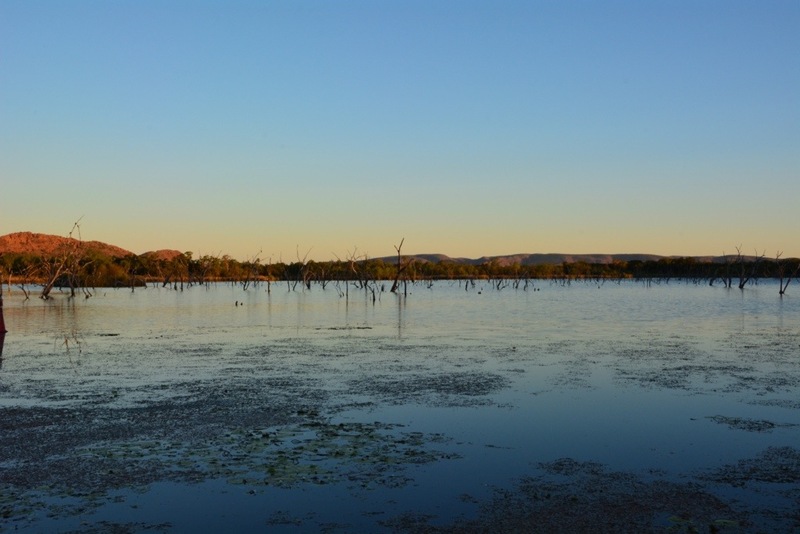 A short but sweet stay in Kununurra. Peter Prado with his spunky new BFG tyres! Man… you guys look great!!! And matt gotta say it – whollee looks like you’ve been working out! Photo on the last blog… had the ‘v’ thing going on and was that nearly a six pack!? as far as you can tell from a blog you guys sound happy!! And the kids are sooo tanned!!!! and big grins!!! i’m soooo jealous looking at those hot pools as i sit here post swim training, drinking coffee and still in wet togs waiting for heater to warm up!!! Very happy for you all! Amazing to think you’re so close to starting dream no….2?? Life as farmers!!! is a pretty amazing gift you pair have been able to give your children well done guys. and an ideal way to really strengthen the family unit ready for your next challenge. awesome!!! Ha! Thanks Kate! My secret is a strict regime of coffee in the morning, 3 white bread sangas for lunch, spearmint leaves and Muesli bars for snacks, 3-4 beers in the arvo and pizza or pasta or steak for dinner. I sit in the car for about 4 hours a day and in my camp chair for the 6. I call it the MF Special diet. Woman’s Weekly can contact me for the exclusive story if they like! 🙂 Seriously, it is nice that we have managed to lose our Brisbane Milky White skins!